The winner of the Clinton County Humane Society’s recent quilt raffle was Angela Earley, pictured with her husband, Jeff, receiving the quilt after the drawing in November. 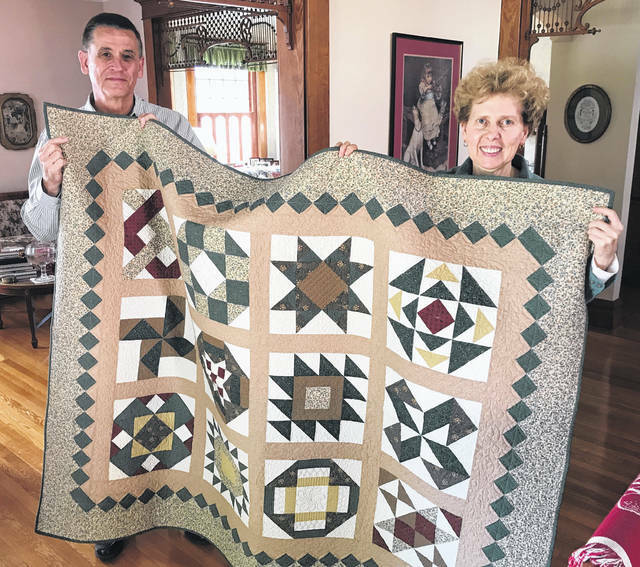 For the shelter fundraiser, Georgann Quallen quilted and donated the 58-by-70-inch Pioneer Sampler, which had been on display at the Cotton Junky in downtown Wilmington. The nonprofit Clinton County Humane Society, located at 1760 Fife Ave., has adopted more than 7,300 animals since it was formed in 2003. The funds raised will help the shelter spay, neuter, and vaccinate the animals in its care.